Chinese President Xi Jinping held talks with his Ugandan counterpart Yoweri Museveni on Tuesday in Beijing, pledging to enhance bilateral and China-Africa cooperation. The two leaders agreed to maximize the synergy of each other's development strategy and build China-Uganda relations as a model modern international partnership, featuring equality, mutual trust, cooperation and win-win results. Xi applauded the fruitful cooperation between the two countries since the establishment of diplomatic ties 53 years ago. 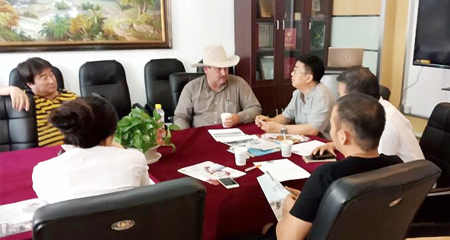 He said the two countries should increase high-level contact, share experience on state governance, and exercise mutual support on issues concerning each other's core interests. China is willing to share with Uganda its experiences in developing special economic zones and industrial parks, the president said, calling on the two sides to cooperate more in infrastructure building, investment, health and tourism. China encourages and supports enterprises to invest in Uganda in energy, mining, industry and agriculture, he said. The president also suggested enhanced cooperation between the two countries in youth, defense, counterterrorism and international affairs. 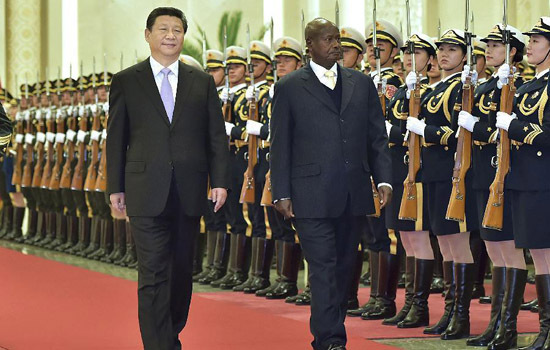 Museveni voiced appreciation for China's long-term support for African countries. He said Uganda hopes to cooperate more with China in infrastructure construction, including hydropower and standard-gage railways, as well as cooperation in oil, mineral resources, tourism and industrial parks. After the talks, the two leaders witnessed the signing of a number of cooperative documents on economic and technological cooperation, infrastructure building and personnel training. On Tuesday afternoon, Museveni offered a wreath to the Monument to the People's Heroes in Beijing's Tian'anmen Square.